This film is less than six minutes long. It’s very well made, with a dark hypnotic beauty. I barely made it through. Filmmaker Josh Begley captures the 280 (reported) concussions in this year’s NFL season. Field of Vision – Concussion Protocol from Field of Vision on Vimeo. Made as a collaboration between Field of Vision and The Intercept. 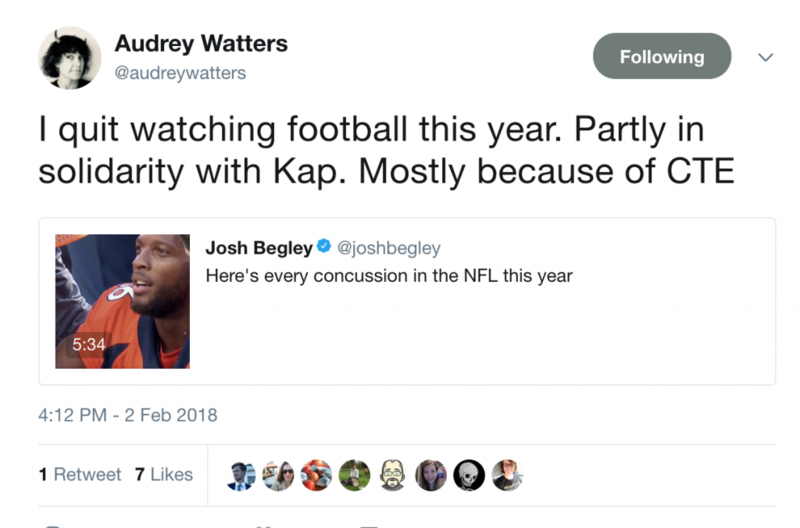 I also recommend a companion podcast conversation between Begley, Shaun King and NFL veteran Donte Stallworth that illuminates not only the sorry state of player safety, but explores the strange and intense political symbolism the game carries in the age of Kaepernick, Trump, and so much else… Very much worth listening, even if you don’t follow the game. More on “What a lifetime of football can do to the human brain”, which notes that the degenerative brain condition chronic traumatic encephalopathy (CTE) may not only be caused by concussions, but the normal and repeated collisions that do not cause immediate injury. The postmortem studies of former player’s brains suggest the syndrome may be very widespread. The game frequently leaves its stars broken in body, and since NFL contracts are not guaranteed, a single hit can leave a player in utter ruin. For a variety of reasons, those gaudy salaries frequently do not provide financial security. “Downward Spiral” by David Roth, offers a detailed rumination of how the sickening machinations of professional football and contemporary political life are expressions of the same dynamics of money, power and race. …In the ways that blank greed and unaccountability have warped and weakened both the league and the sport itself, we can see a funhouse refraction of what corruption does to societies. In both cases, rich men’s self-serving smallness and single-minded dedication to their own narrow interests have put a broader future at direct and dire risk. In both the NFL and the similarly beleaguered American republic, change has never seemed more urgent or necessary, or more difficult to bring to pass. And in both venues of bloated, wobbling patriotic spectacle, the last and greatest reason for hope is the certainty that a present that so poorly serves so many cannot also be the future. Enjoy the big game everyone! Similar to why I lost interest in hockey after the 2004 Bertuzzi incident. I grew up immersed in hockey culture and with a love of the game. But after that incident I thought that, if I continued watching, I would eventually witness someone dying on the ice. And I couldn’t, in good conscience, continue to support that kind of culture. I lost interest for many years knowing that people were being maimed and injured in the name of entertainment. My entertainment. I was complicit. I have never felt the same kind of passion for hockey as I did prior to that incident. And then there are the issues around ownership, stadiums, public money… But I keep watching, cloaked in an ever-thickening sense of gloom.